The Injury Outcomes Research Unit aims to help injured people receive better healthcare by researching how people react to, respond to and cope with injury and trauma. Researchers within the Injury Outcomes Research Unit have expertise across numerous fields, among them medicine, epidemiology, statistics, psychology, health promotion and population health. Additionally, maintaining collaborative networks with leading injury focused stakeholders throughout the world. Injury imposes a major burden both to the injured person and society. Not all patients respond to treatment in the same way, and not all treatments are equal. There is a wide variation in the speed and extent to which people recover. 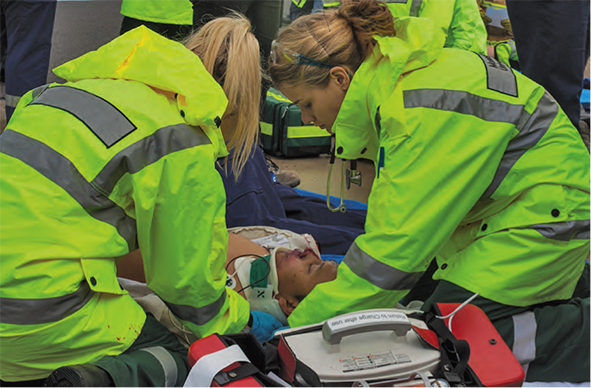 The MUARC Injury Outcomes Research Unit explores the reasons for variation in the way people, injured in workplace and road crash incidents, respond to rehabilitation, treatment and recovery. Through our research we are gaining new insights into how best to care for patients within the Australian healthcare system. Our researchers are working to understand the nature of the problem and establish a range of trials to support evidenced-based improvements in care. Sara Liu Commenced in 2010 and involved a large number of individual research projects. The final stage of the project examined the implementation of the TAC Independence Model, particularly the Independence Plan. This involved interviews with allied health practitioners led by Sara Liu, surveys of staff, as well as an examination of how other compensation systems interact with their most seriously injured clients and their families. The final piece was an overarching strategy document, including an examination of the processes and effects of the TAC 2015 program implementation. This strategy report involved information gathering from key TAC claims managers through one-on-one interviews with Associate Professor Michael Fitzharris, in addition to reference to our previous research. A paper on the TAC 2015 evaluation was published in the online journal, BMJ Open. ‘Fast-Track Recovery’ App 2 years Di Sheppard Di Sheppard received a Motor Accidents Authority of New South Wales Injury Management Grant in November, 2015. The grant will allow MUARC Injury Outcomes researchers to develop ‘Fast-Track Recovery’, an app that will facilitate recovery from non-catastrophic motor vehicle accident injury. This project will endeavour to minimise the risk of prolonged disability for those who have sustained such injuries. The TAC and WorkSafe Medicare linkage studies (ISCRR) The TAC and WorkSafe Medicare linkage studies (ISCRR) were finalised, reported and presented. 'Prevalence of mental health conditions pre and post road trauma.' Sara Liu TAC and WorkSafe Medicare linkage studies (ISCRR) spin-off project that has moved into the final stages. 'Impact of pre-existing health conditions on productivity loss and cost of recovery from occupational injury.' Dr Minoo Farhadi TAC and WorkSafe Medicare linkage studies (ISCRR) spin-off project that has moved into the final stages. Dr Janneke Berecki-Gisolf ISCRR funded. In total, 48,812 WorkSafe claims have been linked with hospital records dating from eight years pre-injury through to two years post-injury. This linked dataset will be analysed and expanded with further linkages to alcohol and drugs data, mental health data and death data. Associate Professor Stuart Newstead Introduced in 2014, the STA policy initiative established decision-making criteria to expedite the approval of treatment requests by case managers. In collaboration with the Institute for Safety, Compensation and Recovery Research (ISCRR), this evaluation aimed to determine whether the STA policy initiative had improved the claims experience of injured workers, their healthcare providers, and the claims agent staff who manage their claims. The findings of the evaluation suggested that while the STA policy initiative has positively benefited the work of staff at the front lines of compensation service, there has been no notable effect on healthcare providers' experiences of the claims process. Authorised by: Chief Marketing Officer, Strategic Marketing and Communications. Maintained by: Accident Research Centre Webmaster Team. Last updated: Aug 2018.